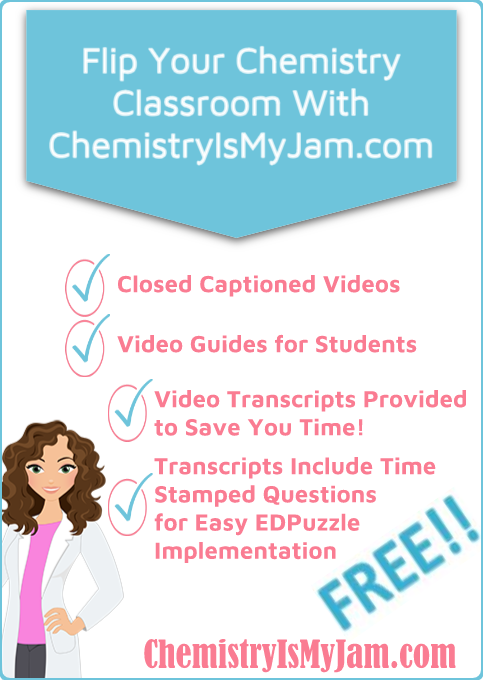 Resources For the Flipped Chemistry Classroom - Chemistry Is My Jam! A well planned flipped chemistry classroom is a beautiful thing! Imagine students entering a classroom with a basic understanding of the material ready for you to guide them through higher level thinking skills so that they can genuinely understand and apply the topic. Imagine having a solid foundation in place and more time for project based learning, AVID strategies, inquiry based labs, and cooperative activities. What could possibly be wrong with this scenario? Teachers are short on time – especially the innovative ones who want to try new things and grow their students. ChemistryIsMyJam.com has been designed with your time in mind. Read on to find out how this site has been designed to help you with the home portion of the flipped chemistry classroom so that you can focus on the classroom portion. How is Content Delivered With ChemistryIsMyJam.com? First of all videos about each of the main topics in chemistry have been created. The videos are divided into short segments that are usually 15 minutes or less. Each video is closed captioned and has a handout for students associated with it. All handouts are in PDF form and follow the general guidelines for ADA compliance. Documents pass the Microsoft Word Accessibility test and should be screen reader friendly. Here is my favorite part: Transcripts are provided for each video! Teachers everywhere are thinking “I don’t have time to watch these videos. How will I know which one covers the topic I have in mind?” You can download a transcript of the entire playlist! Quickly skim the material to choose the perfect video to fit the needs of your students. Or use the whole playlist as you work your way through the unit. You are in control because you know exactly what your students heard the night before. Here is an example video from the Science and Measurement Unit. Click here to find the handouts and transcripts that go along with this video. How Can I Ensure That My Students Watched the Video? There are several learning platforms available that help you see if students have watched the videos you have chosen. One of my favorites is EDpuzzle. The free version of EDpuzzle is quite powerful. It allows you to easily add students to your online class, assign them videos that you create or that you find on YouTube, crop the videos, add audio notes to the videos, see which students watched the videos and how much of the video they watched, and assign questions throughout the video. For Moodle users, the H5P plugin allows many of these same features. Videos you create or that you find on YouTube are embedded into your Moodle course. You can easily add questions to the videos. Grades automatically populate to your Moodle gradebook. I know what you’re thinking. “All of this takes time. I have to go through those videos and add questions.” ChemistryIsMyJam.com has a fix for that too! The transcript of the videos includes suggested questions along with their time stamp. You can easily scroll to the correct place in the video and add the question. These questions are very similar to the ones on the downloadable student handout. So you can either have your students fill out a handout during the video, or answer questions using one of these awesome video platforms. What Types of Questions Are Suggested For The Flipped Chemistry Classroom? 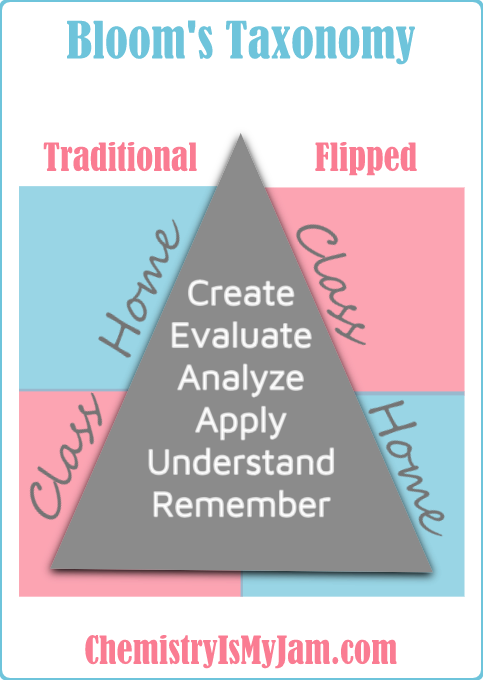 Allow me to begin with a quick comparison of the traditional classroom to the flipped chemistry classroom. In the traditional classroom, many teachers deliver the information, show some examples, give the students some opportunities to practice, and then send them home with an amazing opportunity to interact with the material. In terms of Bloom’s taxonomy, the lower levels of thinking happen in class, while the really impressive stuff happens at home…alone. The flipped chemistry classroom turns this upside down. While students are at home…alone…they tackle the lower levels of thinking. Often, this means that they watch videos that introduce vocabulary, equations, and basic ideas. Then they come to class prepared to interact with the material in truly meaningful ways. They are ready to tackle the higher levels of thinking while you, the expert, are there to guide them. With that model in mind, the handouts that go along with the ChemistryIsMyJam.com videos are learner friendly. The handouts are designed to make sure students are listening to the videos without creating a stressful environment. Handouts typically include a few questions that are directly from the video and a few opportunities for the student to try the concept in a straight forward manner. Typically, the handouts cover the “remember, understand, and apply” portion of Bloom’s taxonomy saving “analyze, evaluate, and create” for when they have an expert present. Content for unit one has been created and uploaded to help you see my vision for the site. Over the coming months the remaining units will be uploaded. Keep an eye on the blog section as well. My next goal is to turn my super nerdy blog into a great place for you to gather ideas. I will be sharing some of the activities that worked well in my classroom, elaborating on chemistry topics, discussing advances in chemistry, and reviewing educational support programs. Is This Really Free? What’s the Catch? The resources that I have mentioned here are absolutely free. There is no catch. Allow me to share my reason for doing this. It has truly been a labor of love. This has turned into my hobby. Some people scrap book. 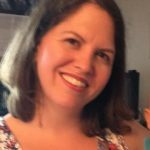 I develop a super nerdy blog. In the end, both serve as a creative outlet. Maintaining a website is not free. In order to support my site, I do include ads. The blog also contains affiliate links that pay a small commission for purchases made through them – at no cost to the customer. Can ChemistryIsMyJam.com help you flip your chemistry classroom? What excites you the most about turning teaching upside down? What suggestions do you have? I’d love to hear from you in the comments!